First of all I designed the case. It should be made of aluminium to be light and stable. Here you can download a zipped .dxf version of it. Then a company lasered the aluminium for me. 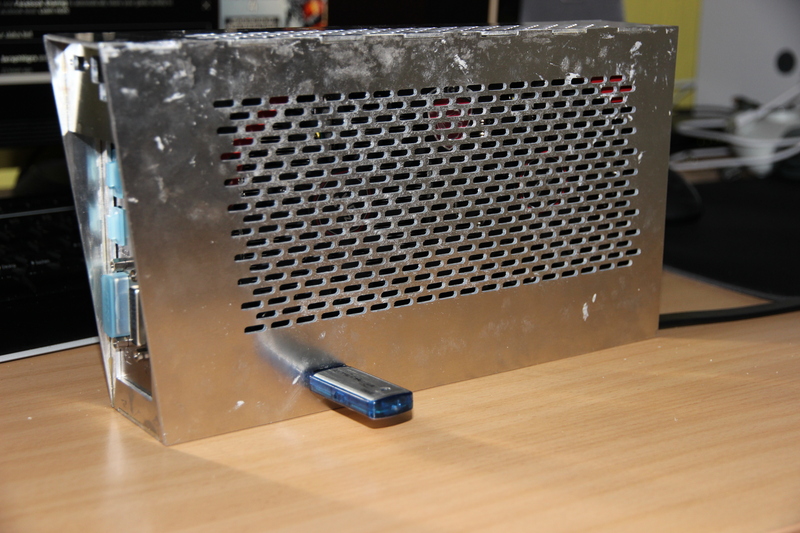 After glueing the aluminium parts together, this is how the case looked before polishing. It also has a usb port to connect for example an usb stick. This is how I made the plug to connect the case internal electronics to the xbox psu. After being polished and lacquered with dull back spray, the case almost looks professional ;). 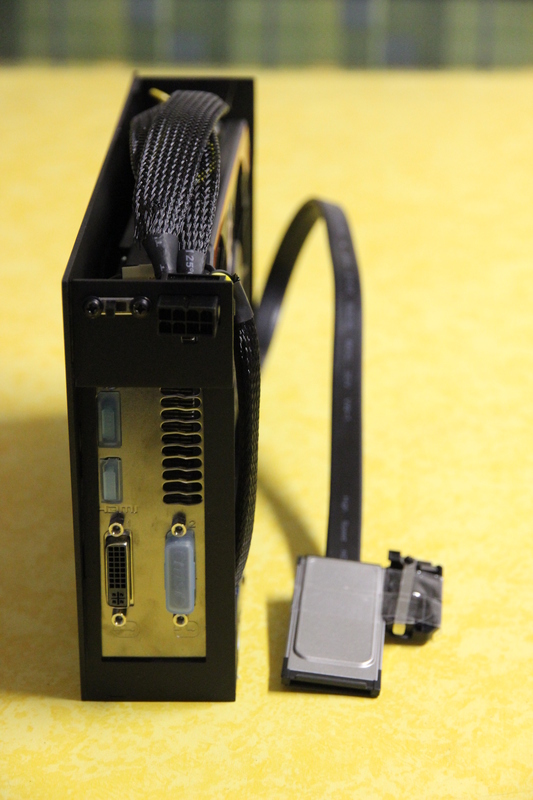 Here a picture from the back, where you can see the on/off switch and the plug to the psu. 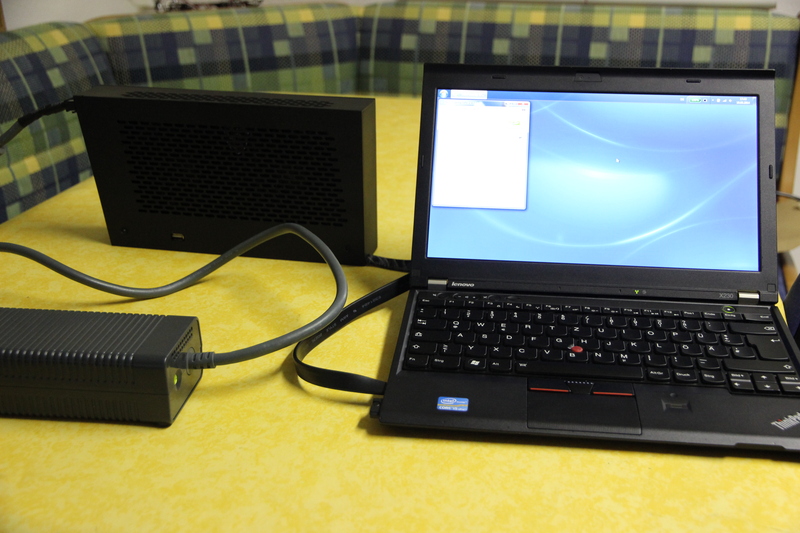 First test: Just plug in the power connector of the notebook (Lenovo X230 with a Core i5-3320M, 8GB RAM) and the xbox psu, connect the eGPU case with the expresscard slot of the notebook, flip the power switch on the back of the eGPU case, and boot up. Then install the graphic card drivers and you’re good to go. This setup can run Battlefield 4 on middle settings with a 2560 x 1440 resolution on an external monitor. On the internal 1366 x 768 display you can play with high settings, due to cpu limitation. It’s also portable and light so you can carry this setup easy in your backpack to a lan party. Nice tutorial and great skills! Well done! Nice one! 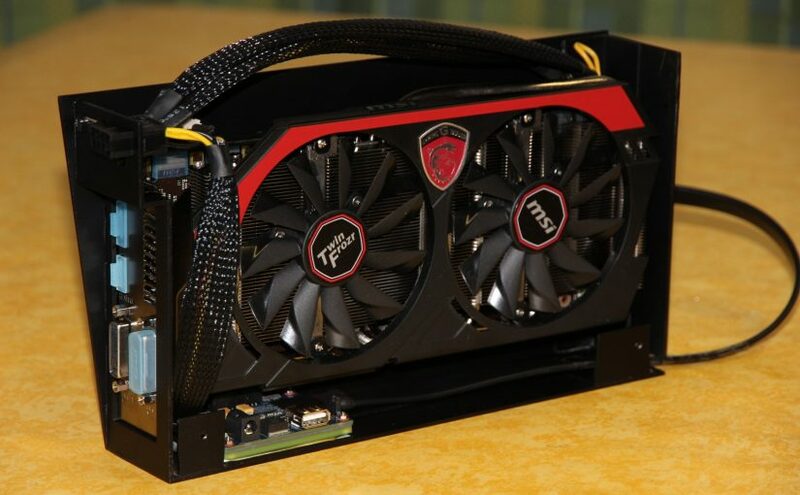 It fits in any GPU, or do I have to change something if I want a different GPU model? And how much did you paid to the company, to laser the aluminium? Thanks! It fits any GPU with max 2 slots and up to 26cm. If you want to use a longer GPU strech my design to fit. Lasering the aluminium did cost 70€. Try to find somebody, who instead uses Waterjet cutting, to get a much cleaner look, and less warping. If you want to save some money, make a design with fewer but larger air holes, because you pay by meters cut. The aluminum sheet only cost a few bucks. Why do you want to use a regular (ATX?) PSU? 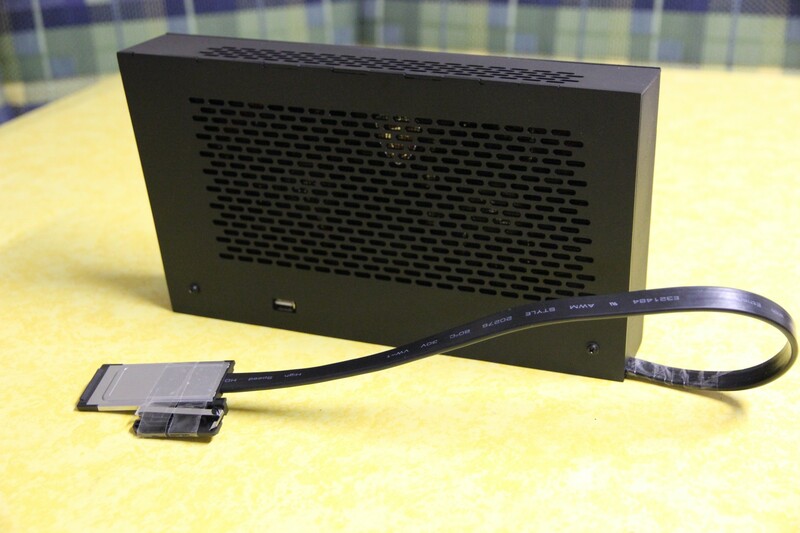 The xbox PSU delivers 200 Watt, which should be enough for a midrange card. I tried to fit a regular PSU into a compact design, but it didn’t look satisfying. It adds add least 10 cm to one of the dimensions, which makes the whole thing bulky. But if you found a good way, I’m interested in seeing what you came up with. Those power requirement apply to the whole system (including CPU, hard drives and headroom for not running the PSU at its maximum capacity). I use a GTX 760, which has a TDP (not equal to the power consumption, but close enough) of 170W . So I guess even a GTX 1070 would be fine, if it is not overclocked. This is by far the best looking egpu enclosure i’ve ever seen!! !I would pay top dollar to get my hands on this low-profile sleek design. Care to share the link on where you bought those cables? In the second section is a link to the design blueprint. Which cables do you mean? The power extensions inside the case? They are just pcie power cables, I cut off from an old pc power supply and soldered to the external connector. You can put the measurements of each piece, please? Download the linked dxf-file, extract it and open it with a CAD program. Alternative upload the file to an online dxf-viewer like https://a360.autodesk.com/viewer/ and use the measuring tool. For personal use I don’t mind if you change or use parts of the design. One more question, what is the thickness of aluminum you used? Good day like your project live in Brazil and here I could not find a similar, could you help me? I wanted to know the model of this source you are using to buy an equal and would also like to know if you can send me more detailed picture of your project. I don’t quite understand, what you mean. 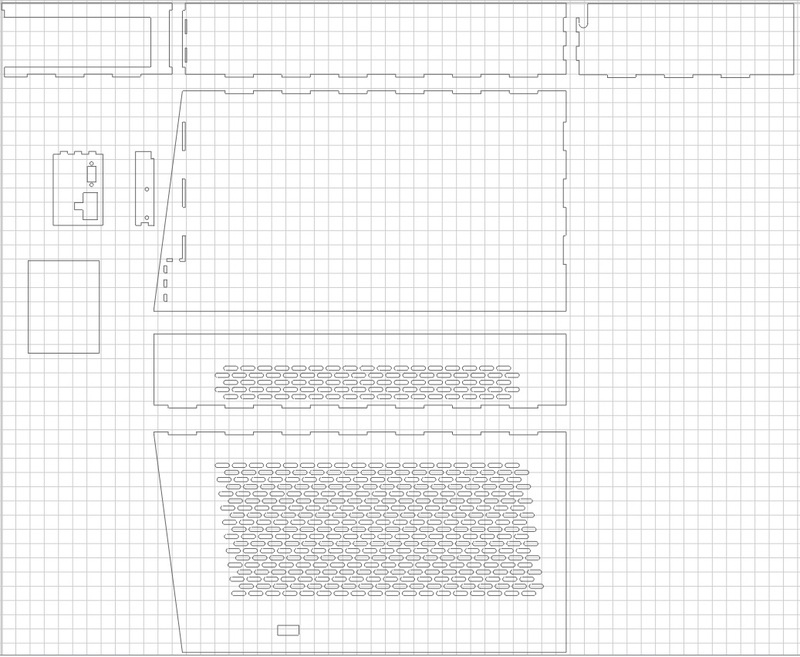 Are you interested how I built the egpu case? Do you need a CAD file? There’s a link in the second paragraph.